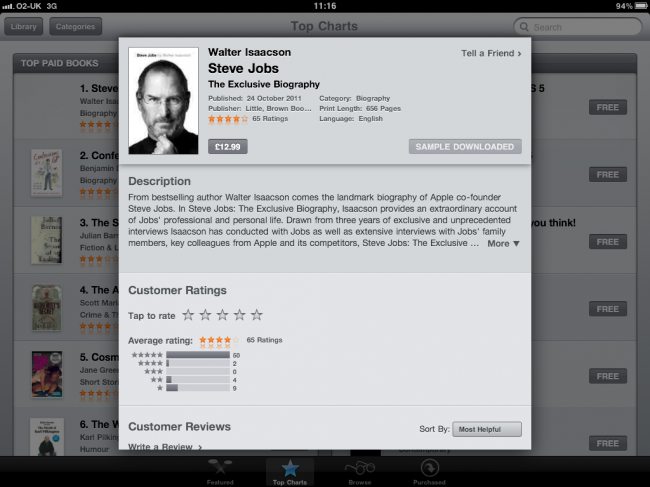 The biography of Steve Jobs is now available to download. It is available in the iBooks store as well as on the Kindle store over at Amazon. Currently the book is showing in the number 1 spot in the charts on the iBooks store. The cost of the Steve Jobs biography is £12.99 in the iBooks store for those in the UK and also £12.99 in the Kindle store on Amazon UK. Amazon released it slightly early although Apple has now caught up with it being the official launch day today. After reading through a few chapters it appears that it will be an excellent book to read providing a lot of insight in to the life of Steve Jobs as well as some history of who he is, where he comes from and what events in his life shaped him to create Apple.